There are some types of food I only crave at certain times. Ginger ale on airplanes. Grilled cheese and tomato soup on rainy days. And tomato sandwiches whenever, for some reason or other, I am reminded of Harriet the Spy. Harriet the Spy may not be one of my favorite children's books, but something in me respects the fact that this book still has the power to make me crave a tomato sandwich every now and then. The next morning Mrs. Welsch asked, "Wouldn't you like to try a ham sandwich, or egg salad, or peanut butter?" Her mother looked quizzically at Harriet while the cook stood next to the table looking enraged. He knew he couldn't go back to sleep, so he boiled water and made coffee. That woke him up a bit. Feeling hungry, he threw together a sandwich of tomatoes and cheese that were in the fridge. Sandwiches have gotten pretty complicated and fancy. Just look at this list. Sometimes I forget that a sandwich can be very good even if it is only two ingredients: two slices of your favorite bread and a perfect slice of ripe tomato. Maybe a little mustard, too, but that's it. Perfection in simplicity. The flames sawed in the wind and the embers paled and deepened and paled and deepened like the blood beat of some living thing eviscerate upon the ground before them and they watched the fire which does contain within it something of men themselves inasmuch as they are less without it and are divided from their origins and are exiles. For each fire is all fires, the first fire and the last ever to be. I've never cooked over an open fire; I imagine that it must be ideal for achieving a nice char on various foods. I happen to enjoy burnt and/or charred food more than the average person...I usually like to slightly burn my toast because of how delicious it tastes after the black bits have been scraped off. Recently, I discovered that charring is a fantastic way to entice people to eat things they normally wouldn't, i.e. cauliflower and kale. So crank up that oven and give thanks that you're not one of those poor souls stoking an open fire in one of McCarthy's gruesome tales. Preheat oven to 450 deg F. Line a baking sheet with foil and spread the cauliflower chunks and garlic in an even layer. Drizzle oil over the cauliflower and sprinkle with salt and pepper. 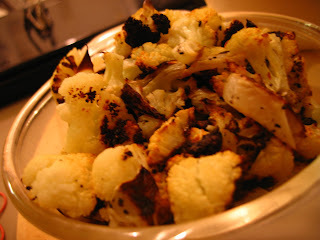 Roast for about 25 minutes or until the edges of the cauliflower are dark brown or slightly charred, no more and no less.